Gen. David Petraeus passed command of U.S. and NATO troops in Afghanistan to Marine Gen. John Allen as he prepares to take command of the CIA. 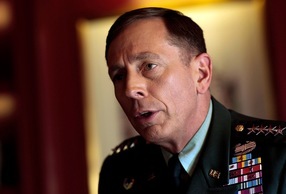 Gen. Allen comes to Afghanistan after a stint as deputy commander at U.S. Central Command in Tampa. He vowed to maintain the “momentum” of the counterinsurgency effort. Gen. Petraeus’ exit coincides with the planned drawdown of 33,000 “surge” troops from Afghanistan, following a strategy similar to what was used in Iraq to quell violence. Petraues ends 37 years of military service, as Leon Panetta vacated the post at the CIA to lead the defense department after Robert Gates retired. Also on Monday, three NATO troops died in eastern Afghanistan and a member of parliament and an adviser to President Hamid Karzai were assassinated. The Taliban claimed responsibility for the assassinations, which come on the heels of the killing of President Karzai’s half-brother, Ahmed Wali Karzai, last week. The Taliban also released a video it claims shows the execution of 16 policemen in northwest Pakistan. The bodies were discovered in Pakistan’s Dir district. In light of the growing scandal over alleged phone hacking by journalists at the now-defunct News of the World tabloid, British Prime Minister David Cameron called for members of parliament to gather for an emergency session so that they can be briefed on the latest developments. Britain’s government has launched an inquiry into whether the journalists committed crimes, and the FBI is also investigating whether News Corp. employees were involved in hacking into the phones of 9/11 victims’ families. Rebekah Brooks, former News of the World editor and close associate of News Corp. head Rupert Murdoch, was arrested and released on Sunday. Brooks has denied any wrongdoing in connection with the phone hacking charges. She is scheduled to testify on Tuesday, along with Murdoch and his son James. Ten people have been arrested in connection with the investigation. The scandal has plagued Cameron, who had hired a former News of the World employee, Andy Coulson, as his spokesman. Many have also raised question about Cameron’s ties to Murdoch’s newspapers in Britain. News Corp. subsidiary News International owns the Sun and the Times newspapers in Britain. News Corp. owns a handful of high-profile U.S. entities, including Fox News, the Wall Street Journal and the New York Post. Japanese fans celebrated their team’s victory in the Women’s World Cup final over the U.S. national team until the late hours Sunday. Japan’s national team rose to prominence quickly in a country where they had little following before the tournament. The final game began at 3:45 a.m. local time. The win comes months after the devastating March 11 earthquake and tsunami, an event Coach Norio Sasaki invoked in his pre-game talk with players. Many are still homeless months after the twin natural disasters hit Japan’s northeastern coast. The tournament victory marks the first time in 25 matches the Japanese team has beaten the United States. According to human rights groups in Syria, clashes in the restive city of Homs have claimed 30 more lives in the last day after fighting broke out over the weekend between pro-government forces and opposition demonstrators. The army has reportedly moved to dampen unrest in border towns. Activists said more than 1,400 people have died as a result of the violence over a four month period, during which international criticism against President Bashar Assad has grown. Despite limited concessions, protesters are calling on Assad to step down.